Steven May in action for Gold Coast. 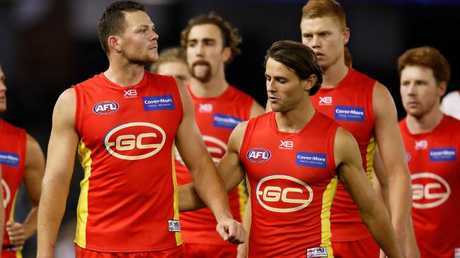 GOLD Coast is happy to hold Steven May to his contract next year, aware Hawthorn and Collingwood will struggle to come up with a trade package to fairly compensate the Suns. The Hawks and Collingwood are the main suitors for Gold Coast co-captain May, with Essendon inquiring about his status but unlikely to be at the front of the queue. May has made it clear that he is heavily considering requesting a trade but as a free agent next year would secure a similar compensation pick to Tom Lynch this season. That would be a top-five pick if the Suns finish bottom five, which is likely in another rebuilding year, meaning Gold Coast has no qualms about holding him to his contract even if he leaves next year. Collingwood's first pick is likely to be pick No.16 or worse unless they secure a high pick if Darcy Moore leaves, while Hawthorn's first pick is at No.14. Both those picks could shuffle several selections back if the AFL next Monday hands out a series of mid-first-round priority picks. Steven May and Lachie Weller after a Gold Coast loss. Neither of those picks would go anywhere near clinching a deal for a player who at 26 is at the peak of his defensive powers. 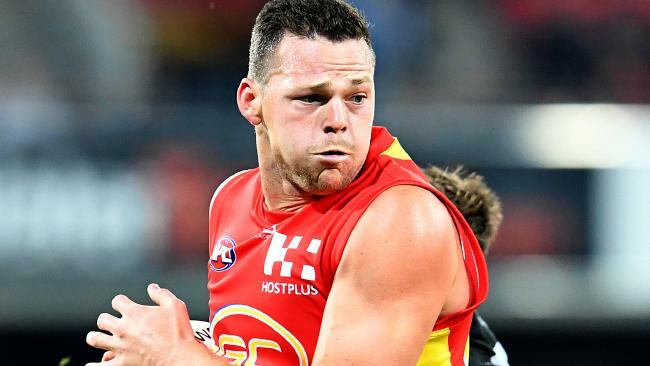 Suns coach Stuart Dew is on board with a strategy that will see May held to his deal unless an outrageous trade is brokered that hands Gold Coast overs for their full-back. The Suns are working towards a contract extension for foundation Sun David Swallow, who is happy to sign on past his free agency status at the end of 2019. The Suns asked salary cap boss Ken Wood about a potential loophole in the salary cap that could have seen them void May's contract next year and securing pick No.4 as compensation for him this year. But the AFL made clear it released a list of unrestricted and restricted free agents at the start of the year and would not add to them through left-field propositions like voided deals. Essendon legend Tim Watson said last week if the Suns lost May in the same year as Tom Lynch, "they are in a world of pain again". "It goes back to building the club and getting the right people there, that's got to be their starting point. "That's exactly what they've got to do - they've got to go back to the beginning and do it all again. They've got to make it a place and a destination where people want to play their football." premium_icon Is Shiel in Giants’ top five players?